Download GATE Exam Syllabus ...! 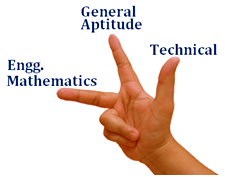 To Crack GATE Examination with good score, follow the GATE Syllabus defined by IITs. GATE exam strictly follow the syllabus and topics mentioned into GATE Syllabus. Importance of GATE Syllabus & Strategy to complete? One must start to learn basics fundaments of subjects mentioned into GATE Syllabus. Selections of good study materials & book are very important at initial stage of GATE Preparations. First cover theories as per exam pattern of last 15years and must practice previous GATE papers & similar questions on regular basis. Most of the questions are conceptual & numerical, so improve your solving ability & time management to score good rank. Experts Review: To Score a good Rank, you must cover & practice 85% of defined GATE syllabus. During preparations must clear all your technical doubts related to GATE exams & GATE Syllabus. Must prepare topics having higher marking weight age into GATE examination. Join GATE Preparations through Classroom, Postal-Correspondence Course by top Faculties from IITs & reputed institutions for better results & quality preparations.